Natasha is the Marketing and Social Media Coordinator for Quotacy, an online life insurance agency for the modern consumer. When not at work, you can typically find her volunteering at the local Animal Humane Society or curled up on her couch watching Netflix… unless it’s football season, then the Packers game will be on. You can connect with Natasha on LinkedIn. 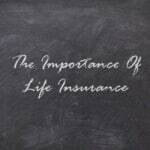 Life insurance is essential and term life insurance is affordable protection. If the unexpected does happen you’ll be thankful your loved ones are protected.